Real Madrid returned to winning ways in La Liga, with this hard-fought victory over Espanyol at the Santiago Bernabeu. Marco Asensio’s strike at the end of the first half, ultimately awarded by VAR, was the only goal of the game, with the hosts riding their luck at times. Espanyol striker Borja Iglesias was a threat throughout, coming closest with an effort against the crossbar in the second half – but the visitors couldn’t find a way past summer recruit Thibaut Courtois in the Los Blancos goal. Having rotated his squad following their resounding win over Roma in the Champions League, Julen Lopetegui will be pleased to have got this potentially tricky fixture out of the way. Real Madrid set up in a 4-3-3 formation, with Casemiro, Dani Ceballos and Luka Modric operating in midfield. Isco and Marco Asensio supported Karim Benzema in attack. 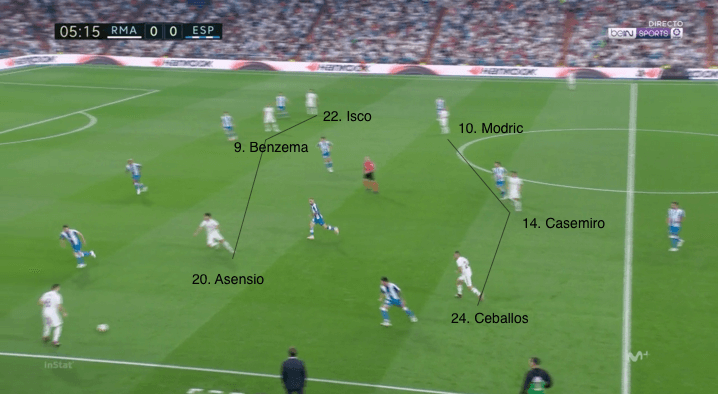 Los Blancos predictably had the majority of possession and were tasked with trying to break down Espanyol’s compact, organised block. 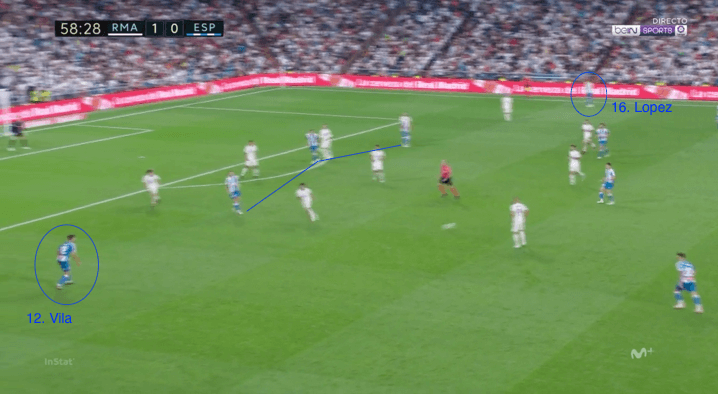 One of Modric or Ceballos would always position themselves between the lines of the visitors’ block, with the other dropping to help Casemiro find a way through. The front three also displayed great fluidity; Isco and Asensio tended to drift inside and swap wings, while Benzema would often drop deep to collect the ball. 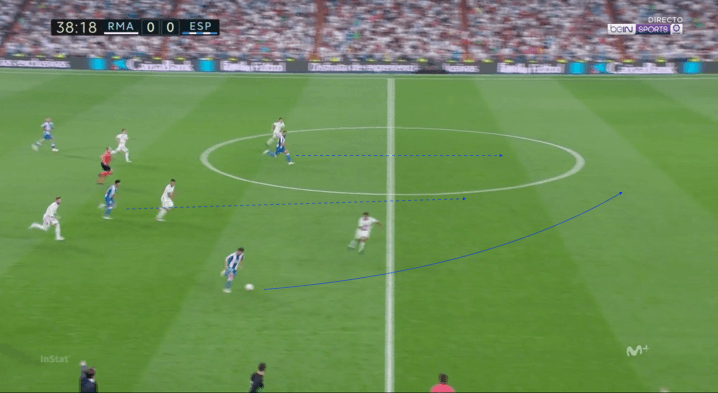 This fluidity was performed in an attempt to try to move individuals out of Espanyol’s compact shape and penetrate through the newly created gaps. The full-backs Nacho and Alvaro Odriozola were also key in trying to unlock the away side. As the wide attackers often moved inside, space was created for the full-backs to push on. 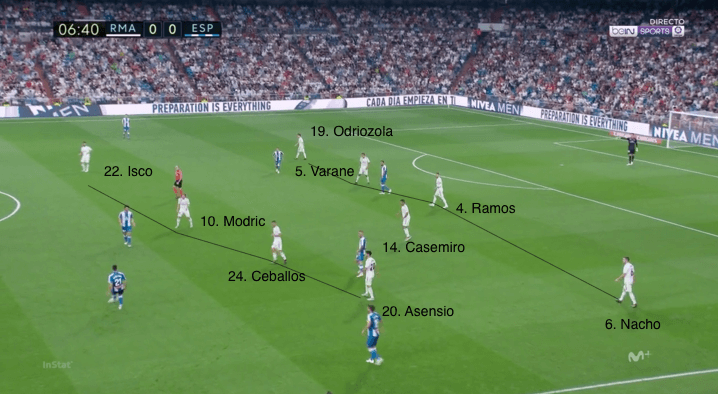 The relationship between these two and the near-side midfielder (Odriozola, Isco and Modric on the right; Nacho, Ceballos and Asensio on the left) was rotational and important in trying to penetrate the opposition. The introduction of Lucas Vazquez for Ceballos shortly after the hour mark allowed Isco to move inside and operate as a central midfielder while still maintaining the threat of a wide attacker. Odriozola no longer needed to move forward from right-back, as Real still had good balance across the pitch, with players occupying threatening positions but remaining secure against the potential threat of a counter-attack. 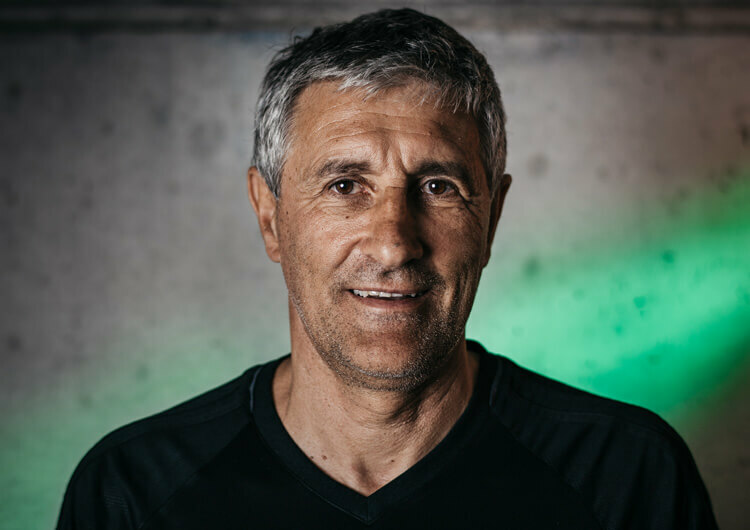 Out of possession, Real would press high and with intensity when the Espanyol goalkeeper and back line had possession as well as in transition, or they would fall back into a mid-block and patiently wait for a mistake. The mid-block would take the form of a 4-1-4-1, with Casemiro between the two lines. Asensio and Isco joined Modric and Ceballos in the line of four, while Benzema stayed ahead of them. When their opponents had good possession, their high level of organisation in their out-of-possession structure meant there was rarely a threat. They did face problems on the transition, though. 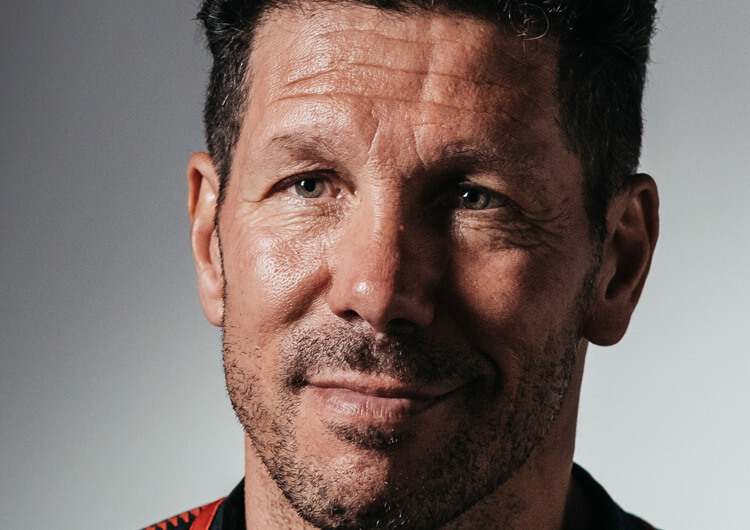 When they failed to regain possession in the immediate instance of losing the ball, the ball was typically sent in behind for centre-back Sergio Ramos to take responsibility for defending. Real could well have been punished for not being cautious enough with their defensive security when in possession. Real Madrid set up in a 4-3-3, with Marco Asensio, Isco and Karim Benzema leading the line. The front three were very fluid in attack; Asensio and Isco drifted inside and occasionally swapped wings, while Benzema wasn’t afraid to drop deep. Real often used a 4-1-4-1 mid-block out of possession, and would wait for Espanyol to make a mistake in possession. This tactic also allowed the home side to regain their energy. The use of the full-backs was key in trying to unlock the Espanyol block. With wide attackers Isco and Asensio often moving inside, space was made for left-back Nacho and right-back Alvaro Odriozola to move forward. 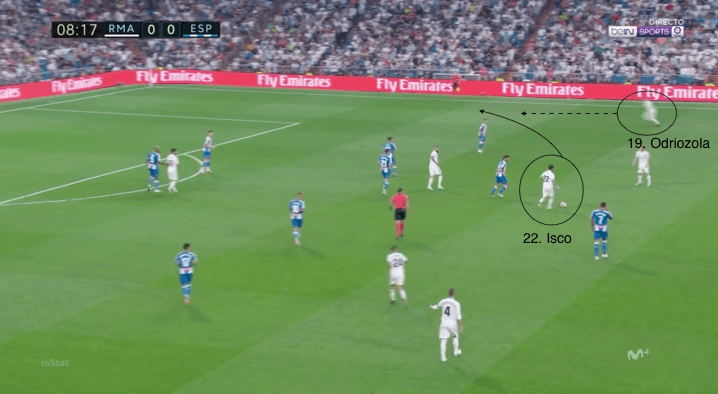 The introduction of Lucas Vazquez shortly after the hour mark allowed Isco to play inside and meant that right-back Odriozola didn’t have to commit forwards as much – this helped to guard against counter-attacks. 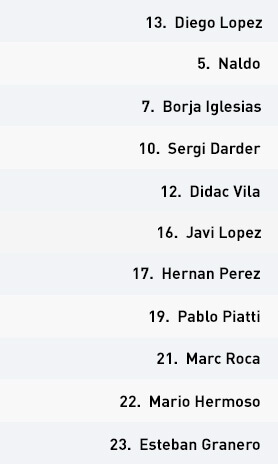 Espanyol set up in a 4-3-3, with Esteban Granero, Sergi Darder and Marc Roca as the midfield three. Roca tended to occupy the holding position. Out of possession, Espanyol used a 4-1-4-1 mid-block for the majority of the game. They worked hard not to be pulled out of position by Real’s fluid movement. Espanyol’s key threat was the counter-attack, from which they should have been more clinical. Real were vulnerable on the break, but the visitors didn’t take advantage of their opportunities to threaten goalkeeper Thibaut Courtois. Espanyol became more proactive as the game progressed, pushing full-backs Javi Lopez and Didac Vila into higher positions. This allowed the wide attackers to play inside and provide more numbers closer to the goal. Espanyol set up in a 4-3-3 in possession, with Esteban Granero and Sergi Darder playing ahead of holding midfielder Marc Roca. Pablo Piatti and Hernan Perez supported Borja Iglesias in attack. Head coach Rubi’s players saw little of the ball at the Santiago Bernabeu, managing only 37 per cent of possession throughout the game. They were naturally cautious in possession in the first half, tending to build slowly with shorter passes to reduce the risk of interceptions and increase the opportunity to counter-press, should they lose the ball. They were also careful not to commit too many players forward to avoid being caught out by a potentially damaging counter-attack. Had they maintained this caution, the scoreline may have been different; on one of the few occasions in the first half where they did play further up the pitch, they lost possession and conceded the only goal of the game. Their key threat throughout the game was the counter-attack, from which they could have scored a couple of goals. As soon as possession was turned over, they would look to play and move forward as quickly as possible to exploit these opportunities. Goalkeeper Thibaut Courtois was called into action more than he would have liked because of an unusually shaky performance from those ahead of him. After the break, Espanyol began to play with more numbers in the Madrid half. Full-backs Javi Lopez and Didac Vila provided the width, allowing the front three to play more inside and closer together, increasing the potential threat from working the ball into the box. 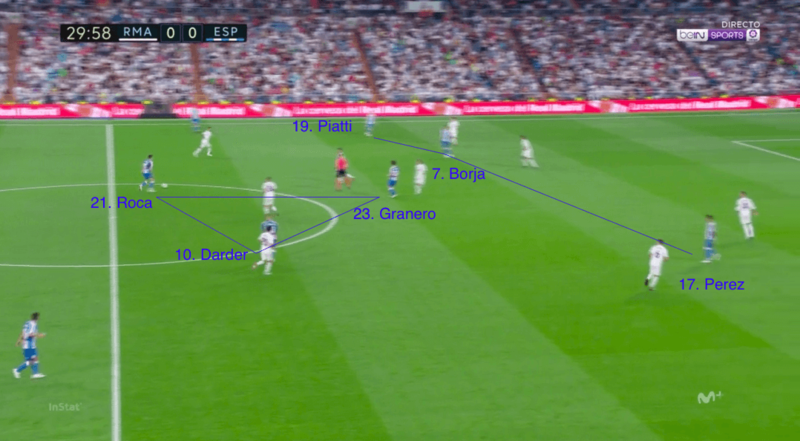 Out of possession, they set up in a 4-1-4-1 mid-block with Piatti and Perez tucking in with Granero and Darder, while Roca tried to control the space between the lines. 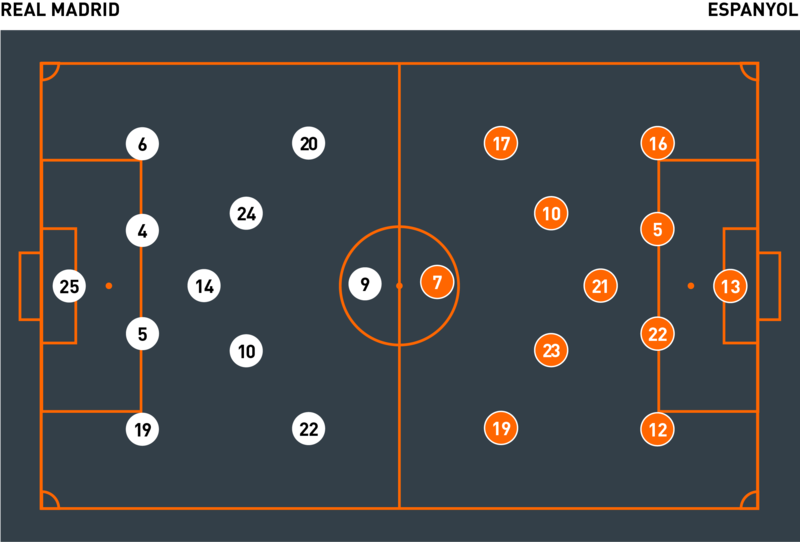 The key was in maintaining their positioning within this structure and not allowing the fluid movement of their opponents’ attackers and midfielders to pull them out of position and create gaps. 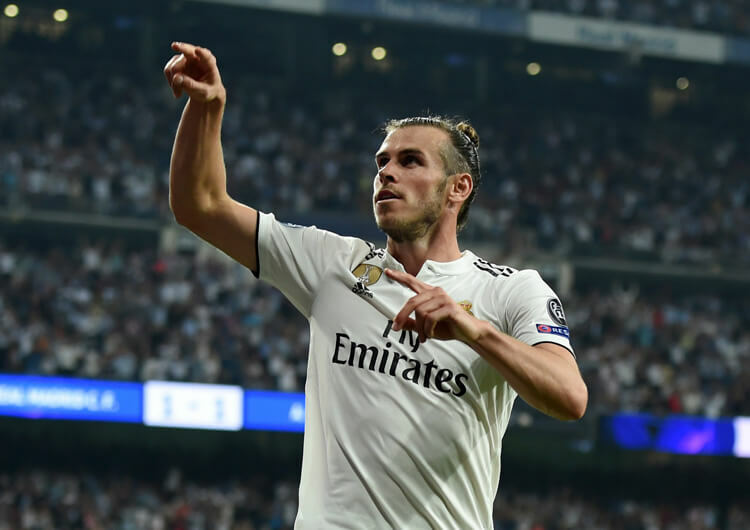 They favoured waiting for passes to intercept – or opportunities to double up in wider areas and regain possession – over committing individuals to tackle Real’s players. The risk of being beaten would have had a knock-on effect on the rest of the team; a new player having to come close and press the attacker would have created space in other areas, leaving them far too vulnerable against top-quality opposition. They were well-disciplined with this idea, usually setting up in a 4-3-3 when the hosts were building in their own half before falling into the 4-1-4-1 as the ball approached the halfway line. They began pressing more intensely and further up the pitch in the later stages of the game, when time was against their hopes of grabbing an equaliser. But for conceding, Espanyol proved dogged opponents in Madrid and will feel frustrated at coming away empty-handed.